Un taller enfocado en aprender a convertir partes de desechos electrónicos y basura en dispositivos de sonido funcionales. Sala Multiusos. Facultad de Bellas Artes, UCM. 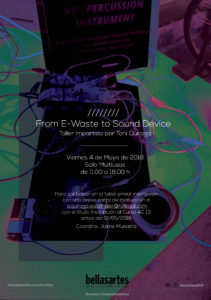 During this workshop you will learn how to turn parts of e-waste and trash into functional primitive sound devices. 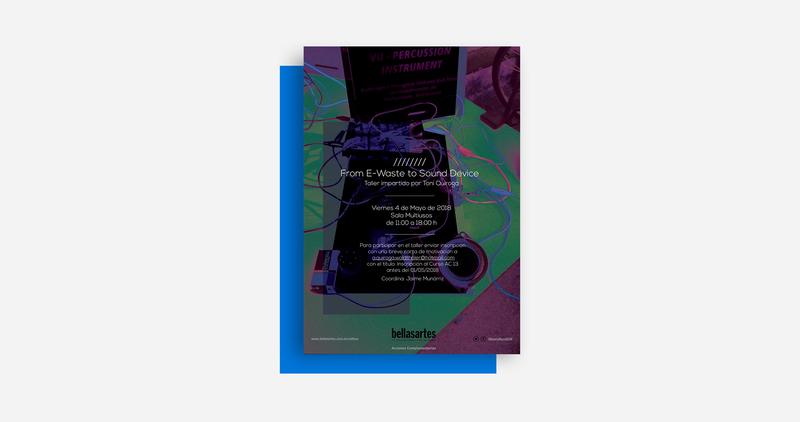 Through the vivisection of dead media devices you will learn how to extract valuable components (like motors, VU meters, integrated circuits, capacitors and electromagnets) and reuse them in order to build a primitive and idiosyncratic instrument. We will build fully recycled electronic gadgets. Each participant’s instrument will vary, depending on what components you find and re-use. No experience in soldering is needed for this workshop. – Some background info about the components we will be re-using. – How to repurpose waste materials in order to create a primitive noise machine. After the workshop you will have fully working sound device built entirely by yourself and from scratch! If you have broken, CD-, DVD- Player’s, radios, nails, copper, aluminium or zinc residuals lying around at home, don’t hesitate in bringing them with you! We will need that! Toni Quiroga works with sound, music, electronics, obsolete and organic matter. He holds a Bsc in Political Economy from the Freie Universität Berlin, a BA in Sound Art & Design from the London College of Communication (First Class Honor) and recently graduated from Goldsmiths University in MA Digital Culture.